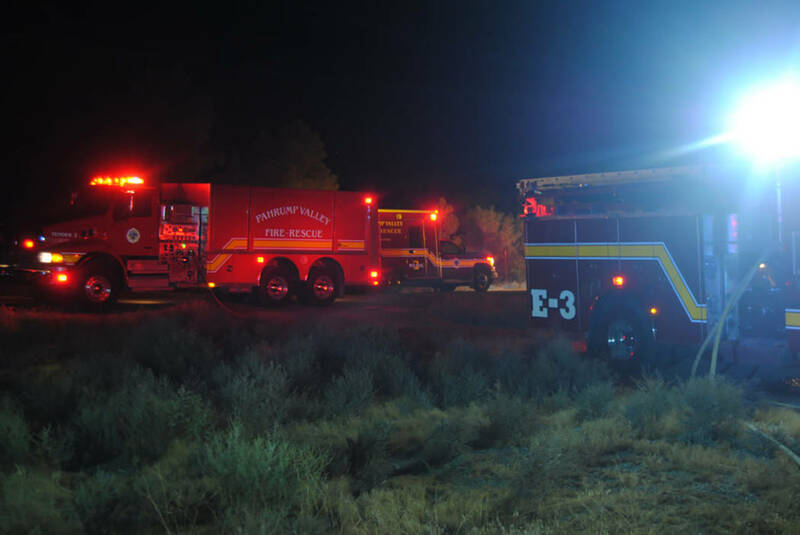 Beginning on Saturday, July 1, through Tuesday July 4, Pahrump Valley Fire and Rescue Service crews responded to an inordinate number of service calls throughout the valley. Fire Chief Scott Lewis said overall, the department had roughly 90 fire-related responses during that period. Additionally, Lewis said the summer of 2017 presented more service calls than in previous years. The service calls continued on July 5, where crews were dispatched to the 3300 block of Our Road for yet another brush fire just after 1 p.m.
On July 7, crews were summoned to the 1700 block of East Basin Avenue for a structure fire just after 8 p.m. Roughly 90 minutes later, crews were dispatched to the area of Rio Rancho Drive at Pahrump Valley Boulevard for a vehicle fire. Upon arrival, Lewis said crews found an engine compartment fire, which was quickly controlled with no extensions. The following day fire crews were dispatched to the 5900 block of South Pahrump Valley Boulevard for a brush fire, which was also quickly contained with no extensions. Shortly thereafter, crews responded and contained yet another brush fire along the 600 block of Barney in short order, followed by a rubbish fire along the 2400 block of East Gamebird. No injuries were reported during the events. On Sunday, July 9, crews were dispatched for a brush fire along North Leslie Street just before 2:30 p.m.
“Upon arrival, crews found the fire as reported where they quickly controlled the fire with no extensions,” Lewis noted. Notwithstanding the larger than normal amount of service calls and triple-digit temperatures over the past week, Lewis said department operations are moving steadily, while fire crews are meeting the challenges.